This fat separator is the classic design, with a spout that connects to the lower part of the cup. A stopper in the spout keeps liquid from entering the spout as the cup is filled, so very little fat will enter the spout. Meanwhile, the strainer top keeps large pieces out of the liquid. The cup is heat resistant up to 400 degrees, which is much higher than the temperature of the roasting juices you’ll be separating. The four-cup size is large enough for the juices from most roasts, and you can also use it for separating the fat from soup stocks in just a few batches. Measurements in US and metric make it easy to see how much liquid you’ve collected, and make this useful all year long as a standard measuring cup. Plus, it's dishwasher safe for easy cleaning. This uses a different design than most fat separators, with a spring-loaded valve that releases liquids directly from the bottom of the container, with no need to pour from a spout. The lid top-rack dishwasher safe strainer has a strainer to remove larger bits from the liquid and it’s extra-deep so larger bits and pieces will hold. To use — just give the handle a squeeze to release liquid and you release before you reach the fat, you'll have room for four cups of liquid here. Since liquid drains from the bottom, it’s more likely to leave drips on the counter after you’ve released the liquid than the spout-style fat separator, but the liquid is less likely to have any fat in it, as long as you stop releasing in time. Do you really need a 4-cup fat separator that will take up space in your cabinet, or is a smaller one a better buy for the smaller turkeys and roasts you make? This has the same design as the standard spout-style fat separators, but in a smaller size that's easier to store. If you’re making a lot of gravy, you can simply fill it twice. This is made from dishwasher safe heat-resistant plastic that will easily handle the heat of your roasting juices, and it has a heat resistant strainer lid that catches the unwanted bits. Like most, the stopper keeps the fat from entering the spout as you fill the cup, and a shield keeps liquid from spilling from the top if you pour a little too fast. What we love is the soft grip handle that's easy to hold onto and easy to read measurements that are in ounces and metric. If you’re trying to keep plastics out of your kitchen, this glass fat separator is exactly what you need. It’s made from sturdy borosilicate glass that’s heat-safe to 300 degrees, so you can pour very hot liquids into it without fear of cracking. The design is similar to other spout-style fat separators, but with a slim, graceful spout and loop handle that makes it look modern and elegant. It has measurements in both US and metric, making it easy to know how much gravy you have. A stainless steel strainer filters out the large bits, and there is a finer strainer included to remove finer bits and sediment, so there’s no need for a second strainer. When it’s not being used for separating fat, you can use this as a standard measuring cup, for heating water in the microwave, or perhaps even for making tea. This is dishwasher safe for easy cleaning. 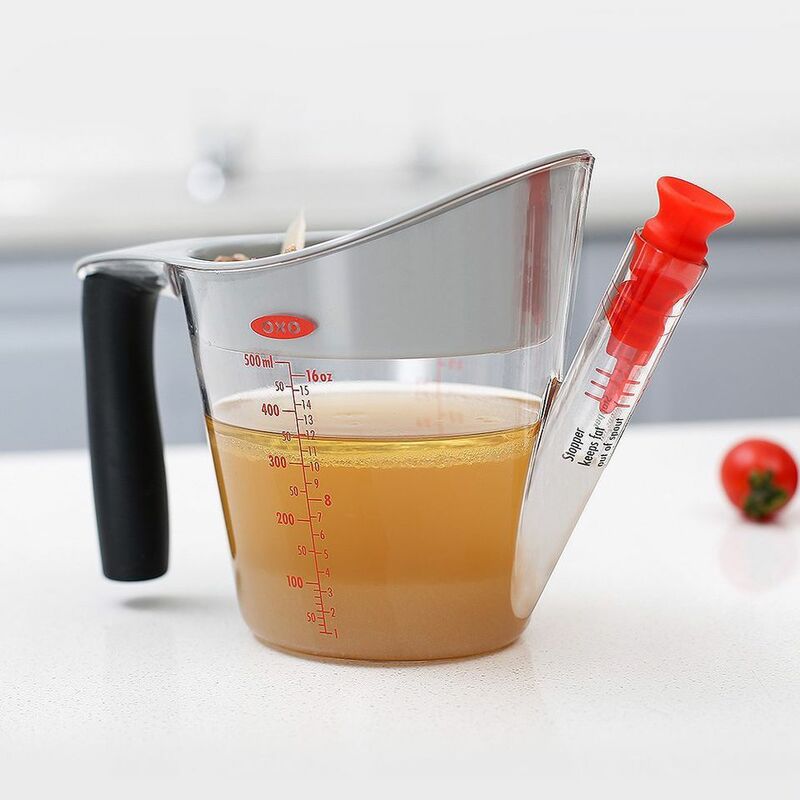 The wide, low shape of this fat separator is reminiscent of a gravy boat, but it’s made for separating fat from juices. Rather than an external spout, this adds an integrated pouring spout that’s designed to take the liquid from the bottom of the cup first, leaving the fat behind. It has measurements on the side in US and metric, so you can see how much liquid you’ve collected. This has a strainer lid to keep the larger bits out of the juice, is heat-safe to 400 degrees and microwave and dishwasher safe. While this isn’t designed to be attractive for serving, it would work well for family dinners to pass around an au jus. If this is your first Thanksgiving or it’s time to be rid of that old fat separator you never liked, this set might be the perfect replacement. It includes both a fat separator and a baster (plus a cleaning brush), so you’ll be ready for turkey or roasts any time of the year. The separator holds four cups, is dishwasher safe and has measurements on the side for easy mixing.The baster has an angled tip that makes it easy to get the juices from the bottom of a roasting pan, and a silicone bulb that’s easy to hold and squeeze. The integrated stand attached to the baster tube keeps the curved tip upright on the counter when it’s not in use, so it won’t drip and make a mess. If you don’t have space for another measuring cup, this unique skimmer might be just what you’re looking for. This removes fat directly from the pot or roasting pan — just press the bottom of the skimmer’s bowl on top of the fatty liquid and the fat that comes through the raised hole collects in the bowl. This won’t work in with shallow liquids, so you might need to tilt your roasting pan to collect the liquid in the corner so it’s deep enough, or transfer it to another container. It would, however, be excellent for removing the fat from the top of the turkey soup you’ll be making in a few days.